Sen. Mazie Hirono (D-HI) said in an interview Tuesday evening that Democrats need to work on connecting with people and have difficulty in this area because they’re so smart and just “know so much” that it’s hard for them to connect. "I wish I had the answer to that because one of the things that we, Democrats, have a really hard time is connecting to people’s hearts instead of [their heads]," she said initially. "We have a really hard time doing that and one of the reasons that that it was told to me at one of our retreats was that we Democrats know so much,” she explained. “That is true,” Hirono emphasized, “and we kind of have to tell everybody how smart we are and so we have a tendency to be very left brain." Hirono said she’d love to see her party communicate their immense intellect to the masses in a language that voters can understand. "I have been saying at all of our Senate Democratic retreats that we need to speak to the heart, not in a manipulative way not in a way that brings forth everybody's fears and resentments, but truly to speak to the heart so that people know that we're actually on their side," she said. 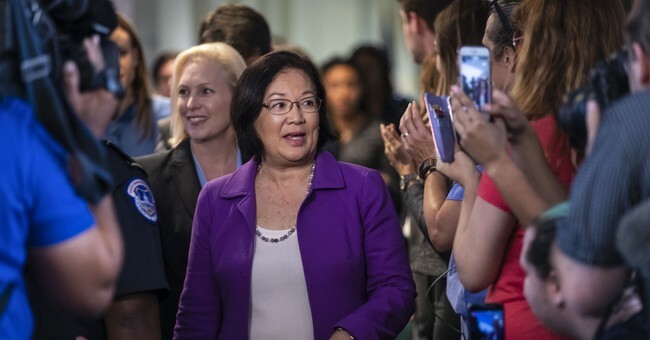 Sen. Hirono gained some notoriety during the confirmation hearings of Supreme Court Justice Brett Kavanaugh for saying that all men in the Senate and the country needed to “shut up” about the sexual misconduct allegations against Kavanaugh. "I think that it just means that there are a lot of people who are very, very much motivated by what is going on,” Hirono said at the time, “because what happened with Judge Kavanaugh is from the very beginning, this was not a fair process."